Girls night out, a night of shopping, induglences and pampering for mind, body and spirit for women 21 and up. Friday, APRIL 26TH from 5-10 pm at ISLETA RESORT AND CASINO benefiting the ronald mcdonald house. ronald mcdonald house charities of new mexico provides COMFORT, CARE AND A HOME AWAY FROM HOME FOR FAMILIES WHOSE CHILDREN ARE IN MEDICAL TREATMENT. 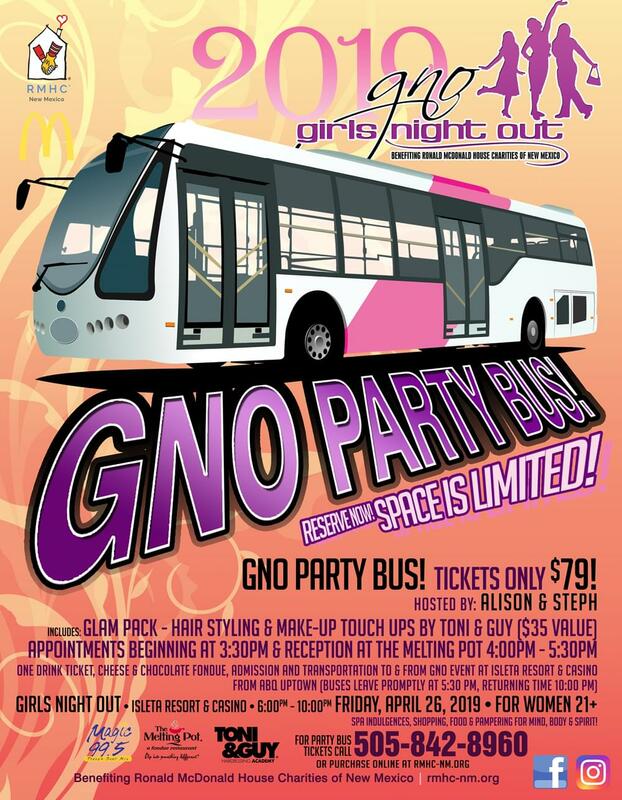 individual, group, vip and party bus tickets now available. visit RMHC-NM.ORG or call 842-8960.